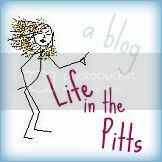 Life in the Pitts: I hate my sister. There, I said it. I hate my sister. There, I said it. CHANTEL. I am so mad at you. These are the kinds of photos that I untag in facebook. FOR A REASON. You're lucky today's your birthday. That is the only thing keeping my feet from your face. ha, I love that...my sister totally does that on facebook, too. Thankfully she doesn't blog! i do the same thing too, untag pics on fb!!!! i bet you can get her back! and ps those werent too bad of photos! i mean, we who have been reading your blog for awhile know you are a bit 'touched' in the head. This is all Kurt's fault. Possibly. How I almost spent 900 dollars. Why my diet isn't working. Interview and Tutorial with Briana!